When ice forms, a variety of bubbles and cracks are produced creating a very artistic effect. The plants on the lake bed release methane gas and methane gets frozen once coming close enough to much colder lake surface and they keep stacking up below once the weather gets colder and colder during the winter. The following pictures were taken at Barrier Lake in Kananaskis and Ghost lake, just west of Cochrane. During the second trip (Ghost Lake), we used some powerful spotlights to create shadows and light effects in the ice. 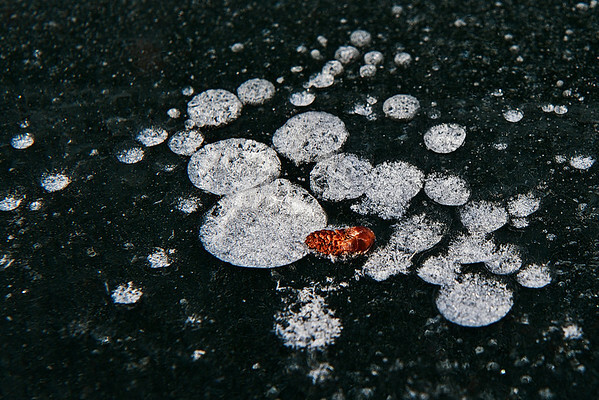 This allowed us to see the intricate patterns created in the ice. Who knew ice could be so beautiful. My thanks to Keith Walker for inspiring these excursions.